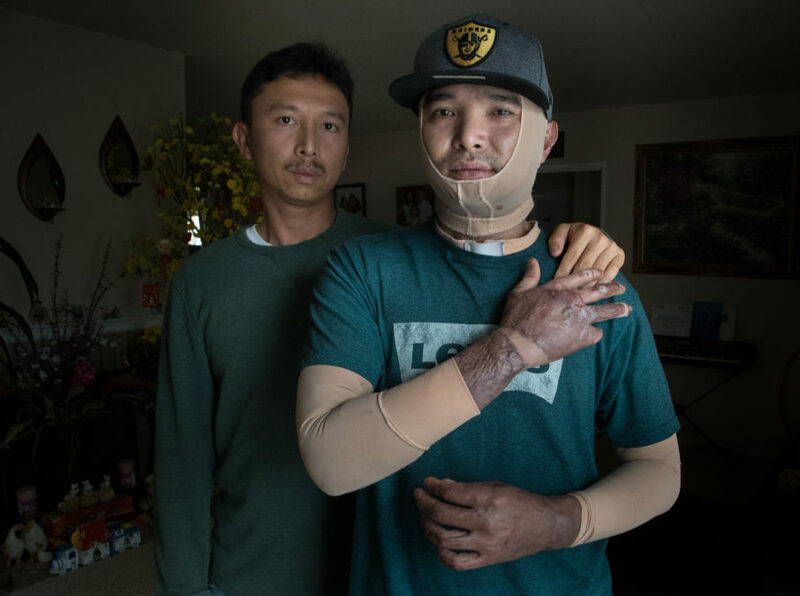 Chuong Nguyen (left) helps look after his brother, Son, as he recovers from a severe burn injury at Tesla's car factory in 2017. “Luckily, I have my family for support,” Son Nguyen said. 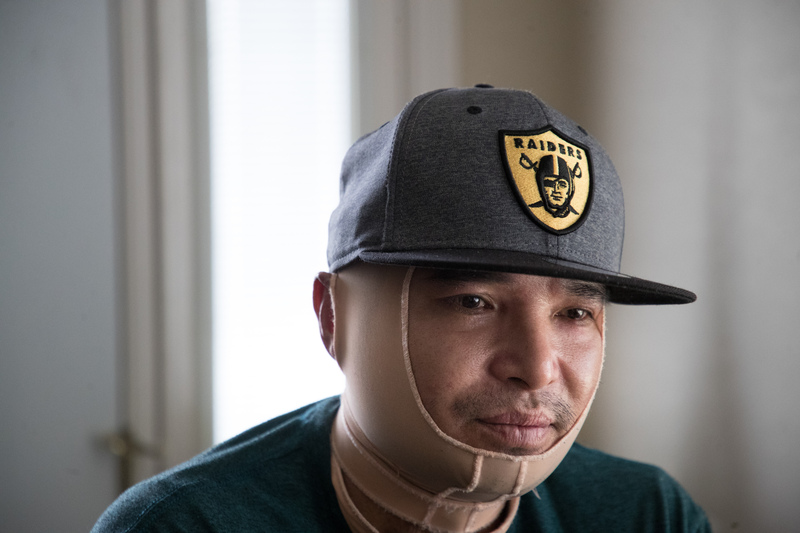 Son Nguyen was working as a contractor at the Fremont, California, factory on June 5, 2017, when an explosion called an arc flash threw him back 15 to 20 feet and engulfed him in flames. Nguyen’s lawsuit says Tesla should have cut electricity to the equipment he was working on, but refused to because the company didn’t want to temporarily stop production. 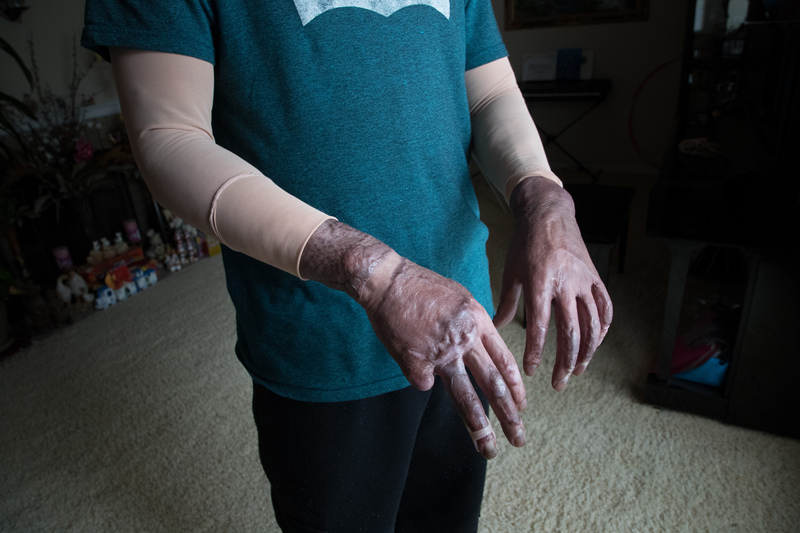 Nearly a year later, he is in constant pain and covered in scars and skin grafts, his pinky finger amputated, a compression garment covering him from head to knees. Nerve pain, which he says feels like “thousands of pins and needles poking you,” keeps him up at night. He struggles with basic tasks and dreads the surgeries to come. Safety officials cited Mark III Construction – and not Tesla – with violations following the accident. However, Nguyen’s suit states that Tesla “controlled” the contractor and safety on the worksite. Nguyen was an electrician trainee working for Mark III Construction, wiring in an electrical plug just before the explosion. Tesla had hired the Sacramento-based company to install dozens of “supercharger” stations where electric vehicles can fuel up. The suit says Tesla supplied Mark III with “old, defective, faulty, unsafe electrical components” with knowledge that it would be dangerous. He spent two months in the hospital getting skin from his thighs and back grafted onto his arms, chest and neck. It was six months before he could use his hands, he said, and he still needs both of them to lift a cup. Dan Carlton, president of Mark III, said he couldn’t discuss the incident because of a non-disclosure agreement. “We learned a lot and it was a horrible accident,” he said. The state agency didn’t investigate or cite Tesla because it determined the company wasn’t responsible, according to Cal/OSHA spokeswoman Erika Monterroza. Regulators could have opened an investigation of both companies if there was evidence that Tesla created the hazard, should have corrected it or had responsibility for safety conditions on the worksite. “That condition did not exist for this incident,” Monterroza said in an email. A former member of Tesla’s health and safety team, however, said Tesla should have done more to supervise the contractor and prevent the accident. A Reveal investigation last month detailed pervasive safety problems at the Fremont plant. Several former members of Tesla’s environment, health and safety team told Reveal the car company put production ahead of worker safety. A day later, Cal/OSHA opened an investigation, which is ongoing. Tesla injury logs obtained by Reveal show four other employees suffered electrical burns in 2017. The lawsuit refers to other electrical injuries at Tesla as evidence of “unsafe work practices” at the plant. In March 2017, a production associate’s fingers were burned, records show. In June, eight days after Nguyen’s accident, an employee’s leg was burned. In late June, there was another electrical burn, and in August, another one. Nguyen has a hard time looking upward because his neck skin doesn’t stretch. He can’t do routine chores, such as getting clothes out of the dryer. He certainly can’t play basketball or go bowling with friends like he used to. But one thing that especially bothers him is his inability to help his parents, who live in Oakland. He used to cut the grass, drive them around and help out around the house. Back in 2014, Cal/OSHA investigated another arc flash at the Fremont factory, and that time Tesla was found responsible for serious safety violations. In that case, recently detailed by BuzzFeed News, a technician named Paul Lewis was cleaning inside a high-voltage electrical panel when an explosion threw him to the ground, knocking him unconscious. In a witness statement provided to state investigators, a co-worker described finding Lewis on his back, bleeding from his mouth and nose. “His arms were burned. His vest was melted. There was a puddle of blood under his head,” the co-worker wrote. When Lewis came to, he didn’t know who he was or what had happened. He had burns on his arms, shoulder, back and face, according to Cal/OSHA records. Safety officials found Tesla didn’t provide adequate training and protective gear and failed to make sure that only a qualified electrical worker performed the task. After Tesla appealed the citations, the $70,000 fine was reduced to $40,400. Tesla has had electrical problems outside the factory as well. An employee received electrical shock and burn injuries in December while working at a solar energy facility Tesla operates in Massachusetts.